Archive for the ‘Summer Fun Ideas’ Category. 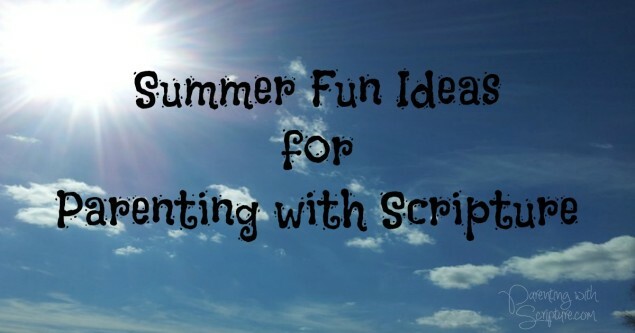 Summer Fun Ideas for Parenting with Scripture! I’m taking off from blogging this summer, but wanted to leave you with some ideas from the past to help equip you to make the most of parenting with Scripture through the summer. If you look in my blog categories (right column on my blog page), you’ll see that I’ve categorized all the topics for easy reference. I’ll be popping back in a couple of times this summer to share articles that I’ve been asked to write on the topics of “Motherhood” and “Legacy” unless I decide to save them for next Mother’s Day. I’m looking forward to sharing with you how my mom and others impacted my spiritual life growing up. Oh, and don’t forget that Parenting with Scripture: A Topical Guide for Teachable Moments could be an easy themed idea book for your summer! 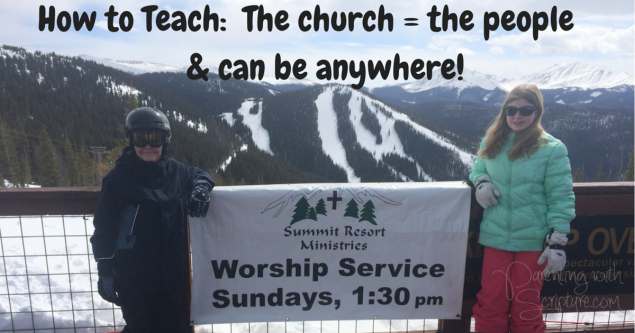 How to Teach: The church is the PEOPLE & can be anywhere! I love expanding my kids’ concept of “church” by visiting other churches when we have occasion to do so. They see first-hand that it doesn’t matter whether the church is big or small, has a building or not, worships with different kind of music than we are used to, etc. The beauty in this teachable moment is that the church is the PEOPLE! And, we’ve found that worshiping with brothers and sisters in Christ, no matter the mechanics of the church, can be a precious experience. Did you grow up with this hand motion rhyme like I did? If not, click here to see it in action. And there’s all the people. Well, my fabulous youth minister turned that around and taught us teens the more Biblically accurate, though non-rhyming version. Use both versions for a fun way to teach your kids the truth of the “church = people,” NOT the building. I have wonderful memories from growing up of visiting my grandparent’s church, my aunt and uncle’s church, and even a sweet little frame church surrounded by palm trees in Hawaii on a vacation my dad won. – The church pictured above is made up of travelers from all over who happen to be in Keystone, Colorado on a Sunday. We worship, not in a building made by man, but in our Creator God’s majestic mountains! The blessing is that my kids have seen first-hand and learned that it’s our common bond in Christ that matters and not the how, when, or where. This summer, consider visiting another church as part of your travel or staycation plans. For more teachable moments, don’t forget to refer to your copy of Parenting with Scripture: A Topical Guide for Teachable Moments. Summer’s comin’ and whether that means a vacation, staycation, or just some scheduled family fun nights, it’s easy to incorporate Scripture! Our family likes flipping through Parenting with Scripture: A Topical Guide for Teachable Moments to find a verse. Write the verse on a notecard. A child or adult can do this depending on the ability of your kid. My daughter likes to use different colored markers as she writes the verse. Kids can also decorate the card. Post it where everyone can see it frequently. We usually put it on the dashboard of our car for road trips and/or display it in the main living area of where we are staying. Pray the verse as a family each morning. See how God’s wonderful Word blesses your trip! Each day, thank or praise God through His verse and how it is helping your vacation. At the end of the trip, imagine what the trip would have been like without the Scripture and compare it to your experience of vacationing with Scripture. 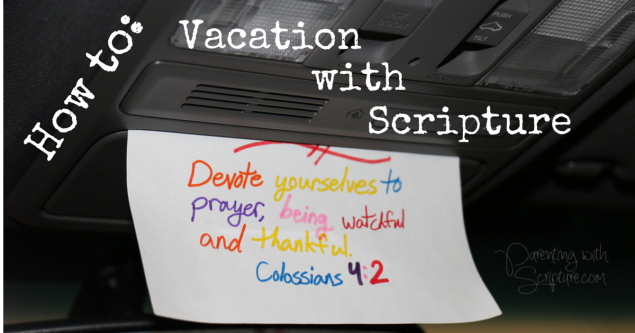 What does Vacationing with Scripture look like in real life? 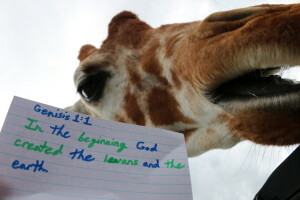 For a mini-trip to a drive-through wildlife park, we picked this verse. We enjoyed praising God through our verse as we marveled at His creation of such amazing animals. For a trip when I got food poisoning and was laid up for 3 days, I recuperated in bed looking at this verse. Well, stink! I guess I didn’t get a picture of the verse. So, I’ll treat you to a snapshot of the fateful lunch when I ate some bad, bad, BAD fish tacos that caused the food poisoning! I had Tim take the picture because I wanted to remember the moment of the beautiful day, open window, feeling the breeze, so happy…..if I only knew what was coming! For a trip when my daughter didn’t feel good for most of the week, we had this verse to encourage us. For a recent road trip to Colorado, we were reminded of being grateful each time we got in the car. It even challenged us to find ways to be thankful as we were dealing with a flat tire on the 14 hour drive home! This verse was such a blessing in general that we decided to leave it in the car after the vacation. 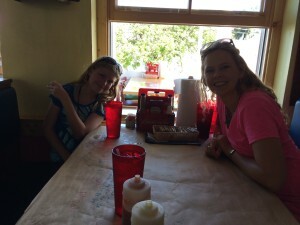 My all time favorite vacationing with Scripture experience is detailed here. A close second is the first time I experimented with vacationing with Scripture. Our family is big on traditions and this has become a must any time we head out the door for a trip. I can’t understate the beauty, blessing, encouragement, and exhortation of being mindful of a specific Scripture while we travel. 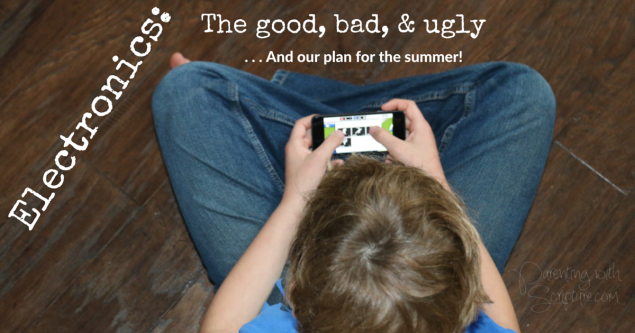 Electronics: The good, bad, ugly…and our summer plan! After one of my children was grounded almost all of last summer from electronics, I realized that even our carefully thought through electronic time limits were excessive. Without electronics as a go-to, that child became more creative, initiated playing long-forgotten games from the game closet with the sibling, finished fun “projects” that had been started but abandoned, etc. Side note: Why was my child grounded from electronics for months? Because losing them for shorter periods of time was a consequence for a certain behavioral issue. Once they were earned back, the child immediately lost them again. Round and round we went with longer amounts of time for the consequence so that the total ended up being about 4 months. I’m happy to say that the persistence in discipline, discussion, and much prayer from this mommy paid off as we have yet to see a repeat of the particular issue. Whew, that was a doozie! Just in our little family’s microcosm of America, I’ve seen the good, the bad, and the ugly of electronics. 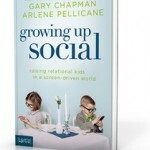 And, I’ve been fascinated to read scientific research and anecdotal stories of the impact through Dr. Chapman and Arlene Pellicane’s book, Growing Up Social: Raising Relational Kids in a Screen Driven World. Summer’s comin’ fast y’all, and I like a plan. This year we are going to try some electronic free days. I’m looking forward to what these electronic free days bring! Anyone with me? Who knows, maybe one of the wonderful byproducts of electronic free will mean more teachable moments! Don’t forget to use your copy of Parenting with Scripture: A Topical Guide for Teachable Moments as a resource! 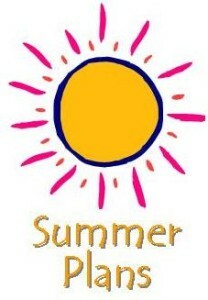 Do you have a spiritual growth plan for your kids this summer? Making your family plans for summer? Swimming, vacation, camp…? Consider being intentional about parenting with Scripture and incorporating a special plan during these off-school months. Summer is a great time to shake things up and try something new with family devotionals. (and other times) as my kids have grown. Browse through and see if any catch your interest! My ABC Bible Verses has excellent verse related stories, but you can also Google or check Pinterest for something like “ABC Bible verses” and come up with free lists. Discuss, meditate, and memorize (if you are ready for a challenge) 2-3 verses a week and you’ll cover the summer! Or, spread it out making it a multi-year summer plan. 20 Bible Verses Every Child Should Know (with cd) – Looks like this one is out of print, but you can still find used copies. This will always be the “sound of summer ’09” for us! God’s Names – This is a wonderful overview of God’s names. I’ve even learned a few things! Walk through what Bible Study looks like with your child. Kay Arthur has a number of Bible Studies written for kids. We have enjoyed starting Boy, Have I Got Problems! James and hope to finish up this summer. You might also find some resource ideas from my blog earlier this year about family devotions. Scroll down through these Summer Fun Ideas. 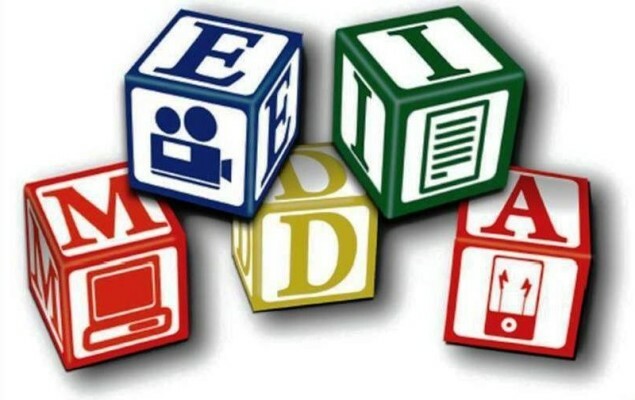 Different forms of media offer a wealth of teachable moment for parenting with Scripture. Be on the lookout when watching movies, reading books, listening to music, seeing billboards while driving, etc. Here are a few media related excerpts from Parenting with Scripture to get you thinking. Soul Surfer – From the “Take Action section under the topic Revenge. Make “Overcome evil with good” your motto (Romans 12:21). When people wrong you, look for ways to surprise them with kindness. By reacting this way, you will be ministering to others when they least expect it and in a way that will certainly catch their attention. The movie Soul Surfer offers a great example of this. Watch how Bethany reacts to Malina’s unkindness, and see how Malina is influenced by Bethany’s response by the end of the movie. Sound of Music – From the “Take Action” section under the topic Confidence. Watch the classic movie The Sound of Music and discuss the song “I Have Confidence” sung by the character Maria. It is near the beginning of the movie when Maria leaves the abbey to become a governess. Yertle the Turtle – From the “Discussion” section under the topic Conceitedness. Can you feel that you are special without being conceited or snobby? *How can you find a balance between the two? Find a copy of Yertle the Turtle by Dr. Seuss, and read it together. *Read 2 Corinthians 12:7. What was Yertle’s “thorn in his flesh” that kept him from becoming conceited? How does this story related to you? *Is there anyone you “step on” to get what you want? *Do you have a “thorn in your flesh” (2 Corinthians 12:7)? *Have you been a victim of someone else’s conceitedness? Look up and read Psalm 119:21 and Psalm 119:51. Aesop’s Fable – The Boy Who Cried Wolf – From the “Take Action” section under the topic Honesty. Online or at the library, find a copy of Aesop’s fable “The Boy Who Cried Wolf.” Read the story and interject questions throughout the reading. For example: After each time the boy cries wolf, ask what your child would do if he were a townsperson. At the end, ask if he feels sorry for the boy. Why or why not? Many children are tactile learners. Consider these fun boredom busters for a hot summer day. 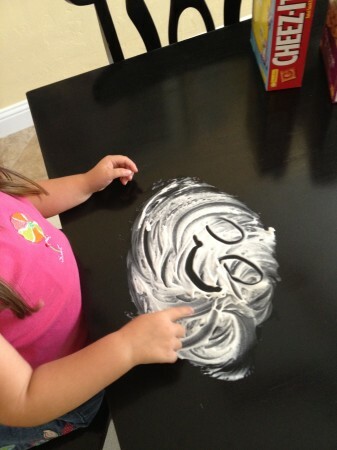 Squirt some on a table, tub, or any surface that can be easily wiped down after the activity. Spread it out with the palm of your hand and let your child use a finger to “write” each word of a verse you are learning, “erasing” with the palm of your hand in between each word. If your child can’t write yet, guide his finger to make the first letter of each word as you say the verse. 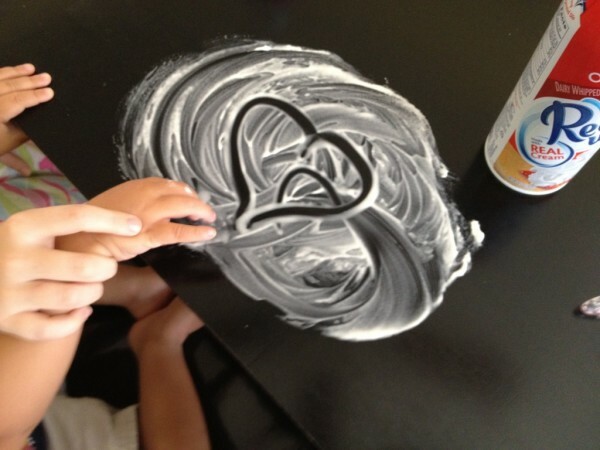 Little ones may be tempted to lick their fingers, so Cool Whip is a safer choice for them. My 4th grader who didn’t want to get her fingers messy! Use playdough to make the first letter of each word of a verse you are learning. 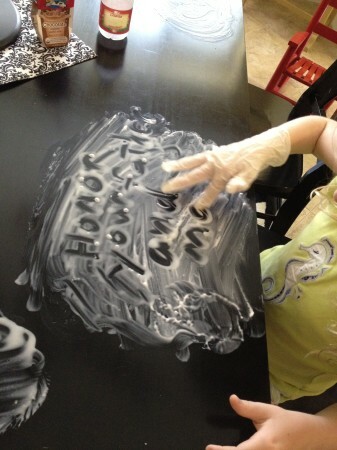 Help your child write a favorite verse with sidewalk chalk. If he can’t write, let him decorate around the verse. If it’s a verse you are helping your child learn, make a game out of it and hop alongside each word as you say them. Start slowly and then see how fast you can get at hopping and saying the verse. Decorated by kids the ages of 3, 7, 2, and 9 (same order below). Use Scrabble game tiles to write out words. Or, make clues with the first letters of words of a verse your child is learning. Balloons: (For older children) Write each word of a verse on a slip of paper, roll it up, and put it in a balloon. Blow up each balloon, tie it off, and let your child have fun trying to keep all of them up in the air. After he’s had a chance to play with the balloons, have your child put on tennis shoes or boots and stomp the balloons to pop them and find the word slips. Then, his challenge is to put the words of the verse in order. Once correct, he can paste them to a paper to keep as a reminder card or memory help for the verse. Texting: (For older kids) Each person playing will need a texting device. One person will start by texting the first word of a verse to another player. The next person adds the following word, and so forth. Think of someone you know who needs prayer. Who doesn’t?! Find a topical verse that fits and remember to pray those words for that person for several days at meal time or bedtime. Help your child write and decorate a card with the verse on it. 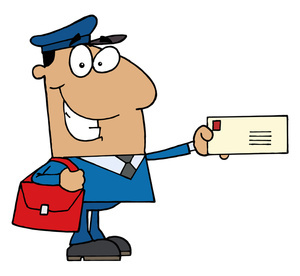 Mail it to the person with a note added that you are praying it for him or her. Consider having your child decorate a second verse picture that you can post on your fridge or put by your child’s bedside to help you remember to pray for the person that week. 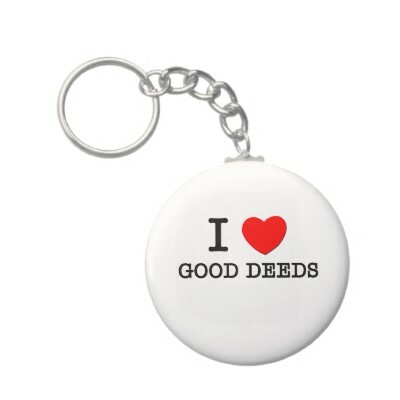 We love these treats and hope you do too! Thankful you’re our neighbor! …So is chocolate! Hope these treats bring cheer to your heart! Have fun delivering these goodies that will bring smiley faces and happy tummies! 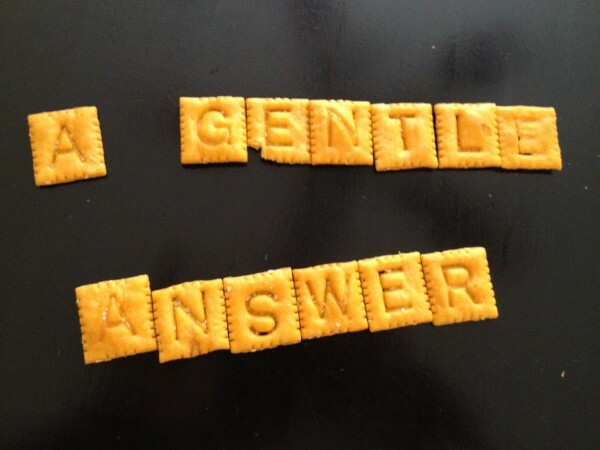 Use Alphabits Cereal or Cheez-It Scrabble snack crackers to write out words of verses, or the first letter of each word. As each letter or word is eaten, see if your child can still say the verse. See if you know the rest of this verse. If you need a hint, look up Proverbs 15:1.